Today I am adding another Crazy Cake flavor to my Crazy Cake collection – Chocolate Peanut Butter Crazy Cake! 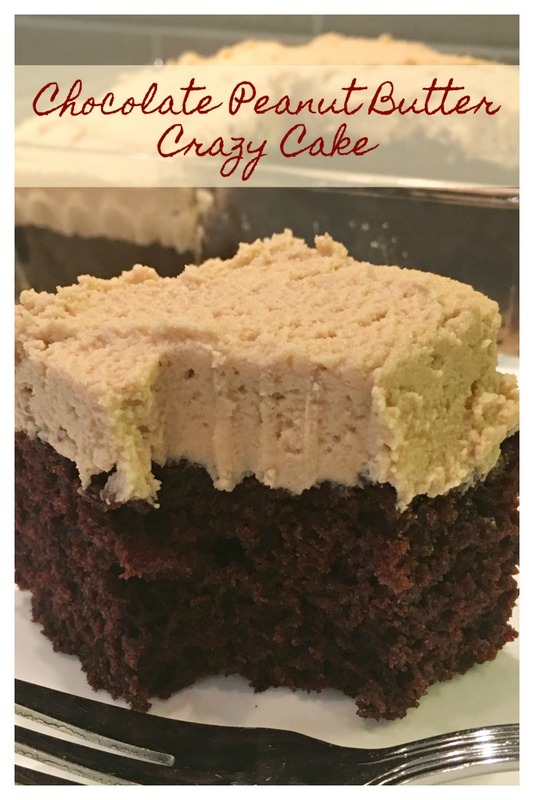 CHOCOLATE PEANUT BUTTER CRAZY CAKE – A vintage, Depression era cake, also known as Wacky Cake, Depression Cake, Poor Man’s Cake, War Cake and more. A super moist chocolate cake topped with a dreamy peanut butter frosting, sure to cure that chocolate peanut butter craving! Best of all, it’s budget friendly, made with everyday items found in the kitchen. This is also a fun activity to do with kids! And if you’re looking for an egg-free option, add this one to your recipe box, there are no eggs in this delicious cake! 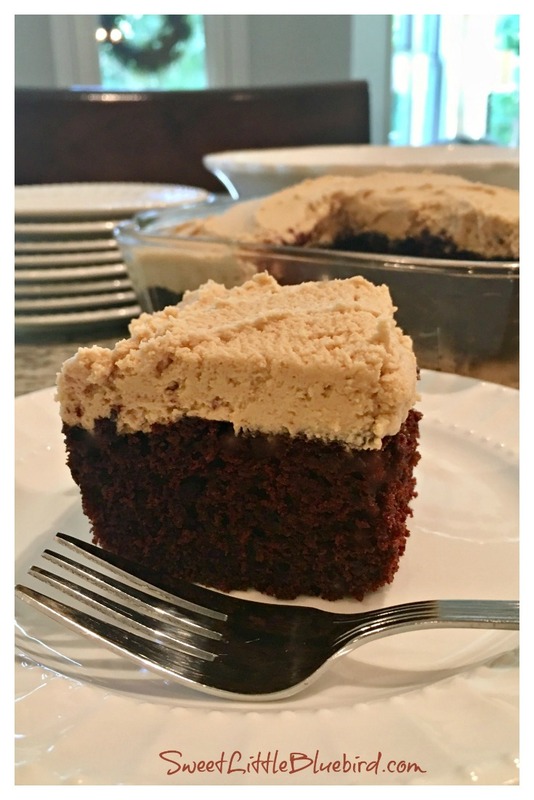 This cake combines my family’s favorite chocolate cake (Crazy Cake, No Eggs, Milk, Butter Or Bowls) and my favorite peanut butter frosting, making one amazing dessert! Unlike all of my other crazy cake flavors, that do not call for eggs, milk or butter, the frosting for this cake calls for milk and butter. 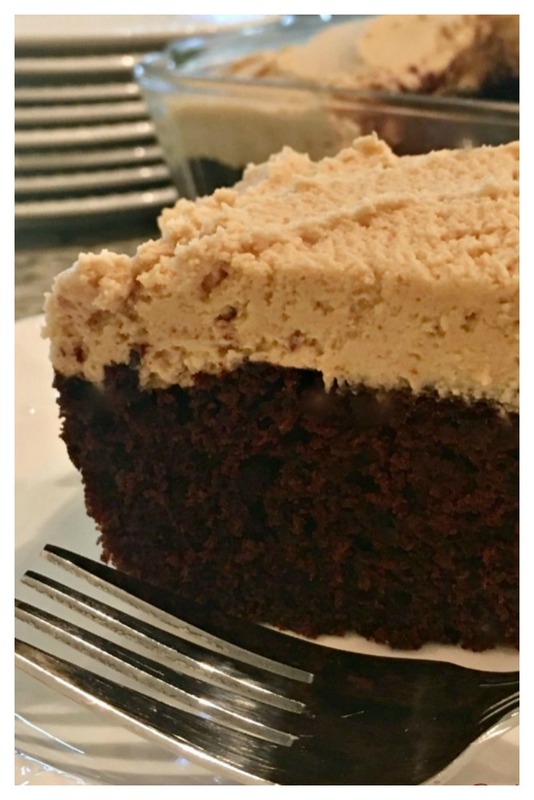 If you are looking for a dairy-free or vegan cake, please check out the dairy-free/vegan peanut butter frosting options below, in the tips section. Looking for wonderful cakes that are egg, dairy free and vegan? 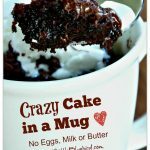 Be sure check out my Crazy Cakes page with all my Crazy Cake flavor options! My girls thought this cake should be called Buckeye Cake because it tastes like a Buckeye in cake form…but being from Michigan, that was never going to happen. GO BLUE! One thing is for sure, if you love peanut butter and chocolate, you will love this cake! For a step by step photo tutorial on how to make Crazy Cake, head over to my Chocolate Crazy Cake post. Bake on middle rack of oven for 35 minutes. Check with toothpick to make sure it comes out clean. Cool. Top with the Peanut Butter Frosting below! *Very Important – before making, be sure all ingredients for the frosting are at room temperature. Place butter and peanut butter in a medium to large size bowl, beat using an electric mixer until smooth and creamy. 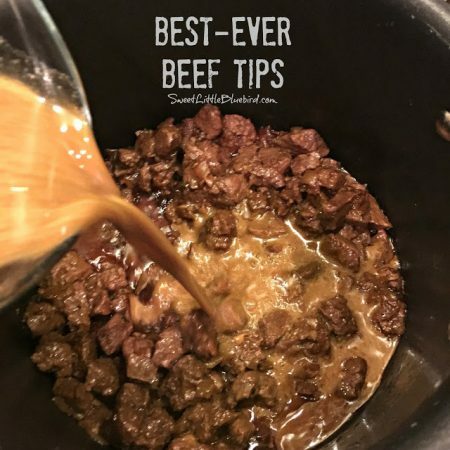 Next add two cups of confectioners’ sugar, beat until blended well and it begins to thicken, then add vanilla (optional) and 1 tablespoon of milk at a time (3 tablespoons total) – mix for approximately 3 minutes, until it’s lighter, fluffy and spreadable. If frosting is too thick, add a little more milk and beat. When ready, frost cake – enjoy! How do I store this cake? Refrigerate or countertop? Never mind. Read through comments. You can. Hi, You referred to this as also called wat cake. I’m wondering if you can help me find another cake with that name. My mother made a wat cake that was a dark batter with lots of raisins. She usually frosted it with a Carmel type icing. Unfortunately, none of us learned how to make it and Mom never used a written recipe. I would love to find that recipe. Thank you! Are there no eggs used in this recipe for the chocolate peanut butter cake? That’s correct, Pat – no eggs in this recipe. Can I used canola oil instead of vegetable oil? If I double the recipe can I do a 9X12 pan? Can any one explain why the strange way of mixing the ingredients? Could this be doubled to fit a 9×13 pan? 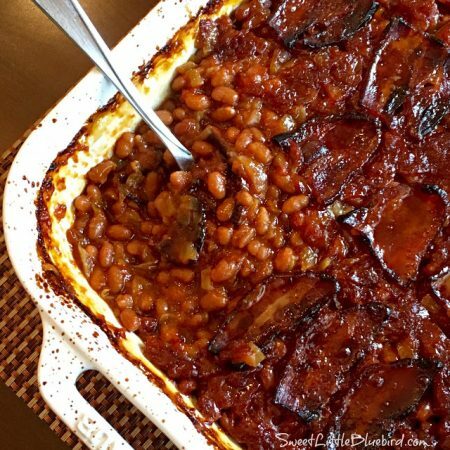 Yes, Katy – I double this recipe often and use a 9×13 baking dish. I got all excited to make this “non-dairy” recipe, then I saw butter and milk in the peanut butter frosting. 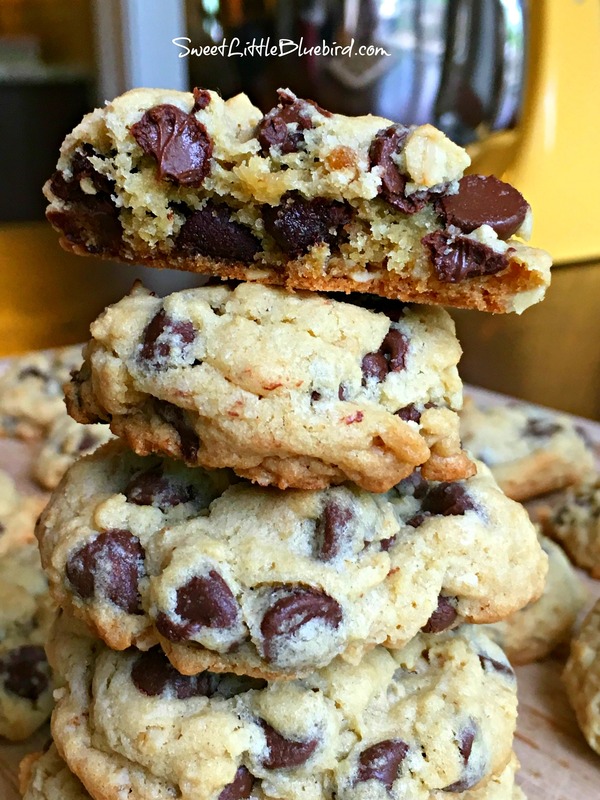 Since that’s what makes the cake appealing, this can’t be called a “non-dairy” recipe. Disappointed. 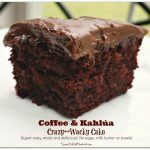 Cathy, this crazy cake recipe flavor is not non-dairy free, only egg free – the cake portion is both egg and dairy free. 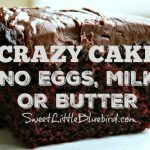 In my post – “Unlike all of my other crazy cake flavors, that do not call for eggs, milk or butter, the frosting for this cake calls for milk and butter. 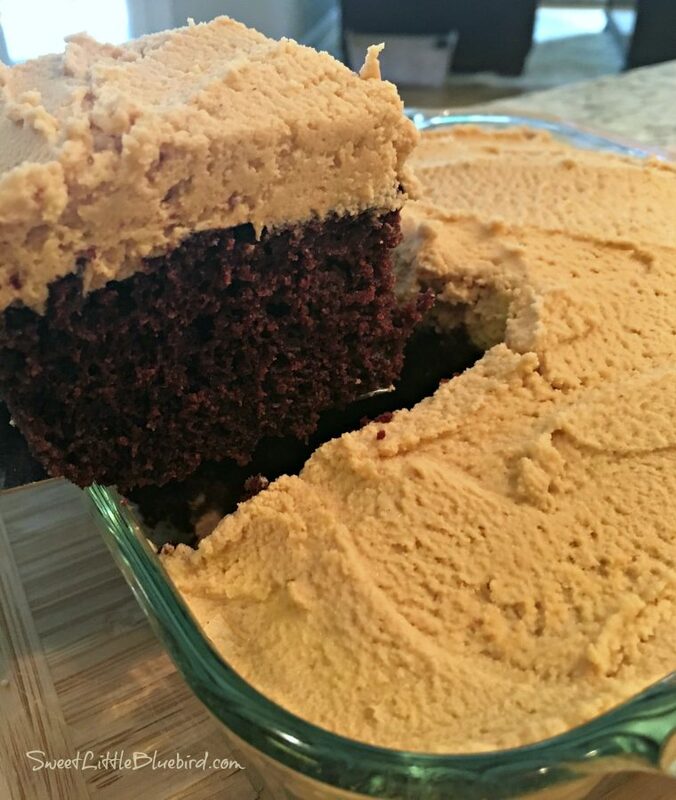 If you are looking for a dairy-free or vegan cake, please check out the dairy-free/vegan peanut butter frosting options below, in the tips section.” Most people know crazy cakes for being egg, butter and milk free. I always try to supply variations so everyone can enjoy these wonderful cakes. The Peanut butter icing/frosting alternative recipes I share below (dairy free) are great options. This cake, this icing, oh my. 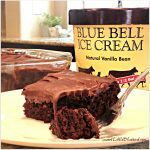 I was brought up on this cake and peanut butter icing. I made it for my children and my husband and I still enjoy it. So glad to see this more public!! My love for chocolate cake with p.b icing stems from my dad and him askin my grandma when he was young for it! Its so tasty!!!! I am looking for great vegan recipes,and love crazy cakes.Need some good frosting’s and holiday dishes. That looks sooo good! We are huge peanut butter and chocolate fans and I love how easy crazy cakes are to make. 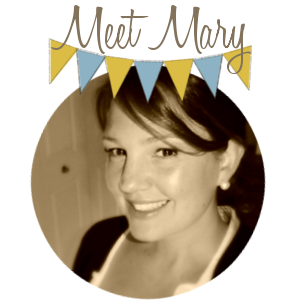 You are definitely the crazy cake queen!